Ben has been practicing walking in the water all summer long. Here is a one-minute clip of him showing off his skills. and one more homemade cake from Logan! Ben is a big superhero float in a parade. Some people are playing the game, "Who is Cool?" and they are carrying cards to vote for Ben. Ben is holding the world because the world needs him. 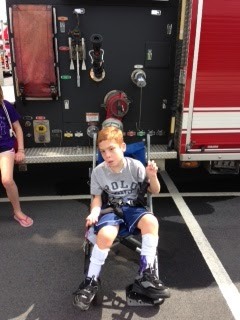 A few months ago, our medical equipment representative offered us a wheelchair for Ben. Another family donated it to the company because their daughter outgrew it. Always ready to try something new for Ben, especially for free, I accepted the offer. We kept the chair for many weeks, but unfortunately it was too big for Ben and he always found a way to slide under the belt, leaving his body hanging and his neck in a choke hold. Although comical to watch Ben try to get out of the chair, I knew it was not going to work for him. I contacted several people to see if they knew of a family who could use the chair. I did not get any solid responses. Our friend, Celeste, at North Carolina Assistive Technology suggested we try the NC Exchange Post, a site like Craig's List, but specifically for equipment for disabled people. After posting the chair on the NC Exchange Post, we received a hit quickly. It was from a grandmother, Ellen*, needing a chair for her granddaughter, Adrian*. Ellen drove two hours to pickup the chair, and she stayed an hour with us swapping stories about our special kids. Strangely enough, Ellen and I share similar careers. She owned her own business facilitating team building and leadership activities through high and low ropes courses. She brought her album with photos of courses she built many years ago, probably around the time these types of activities became popular. She is a creative and resourceful woman. I am glad to have met her. We did not meet Adrian, but through a few photos and short videos, we were able to see she has a bright smile and happy disposition. We are glad the wheelchair found a good home with her. * Names have been changed for privacy concerns. An unexpected perk of having a ramp is that using Ben's tricycle just got a million times easier. The trike is bulky and heavy, making it cumbersome to get up and down stairs. With the ramp in place, it is easy peasy. Now, the trike is stored on the front porch, next to the ramp and is seen as another mode of transportation for Ben. Ben understands the concept of pedaling - something we have worked on for many years. Now, his biggest difficulty is keeping his hands on the handlebars. We have blue tape wrapped around the bar to help him see where his hands need to be placed. However, he does fight us, and we have to continually prompt him to use his hands. Ben's occupational therapist will do some work with him in the coming weeks. We may also try putting a textured tape or material on the handlebars to entice him to hold on. It was suggested to try the gloves that will keep his hands locked in place. Personally, I think this will anger and frustrate him. I would like to try some other ideas first. I will keep you posted on how this works. Ben's adaptive tricycle was purchased through AMBUCS, a gift from his Aunt Olivia and her family. It has movable parts so it has been able to grow with him over the last several years. Ben was definitely more motivated to ride on this day when his brothers were on their own bikes. Ever curious about Ben's cool equipment, Logan and Sean couldn't wait to get their hands on Ben's trike. It came in the form of, "how can I help get Ben down the ramp." Groundbreaking Ceremony - Logan made the first dig. Sean stepped in for a consult. Logan lent a hand when they got to a tough spot. Logan wondered what he got himself into. At times, three strong men were needed to remove branches. AJ did most of the heavy lifting. Without the expertise of Sean, I am not sure how this ramp would have turned out. Ben sat with his friend AJ to oversee the volunteers. AJ took a particularly close look at them with his binoculars. Shoeless Ben managed from the sidelines. 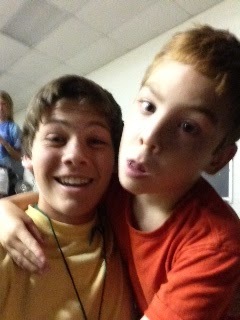 Ben attended Rainbow Express Camp again this year. Although I was not the person bringing him to camp, I was told that he was banging on the glass to get out of the car once he saw where he was going. One of Ben's mighty abilities is his memory. We do not go anywhere near this church during the year, but every year, without exception, he is clamoring to get in there. Matthews United Methodist Church's youth program coordinated the entire week. 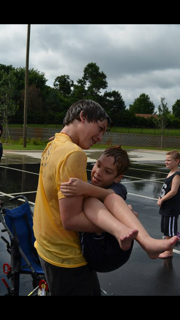 The teens in the program served as the camp counselors, and they worked their tails off all week making it Ben's favorite place to be. If Ben looks a little tired, he was. In addition to participating in a fun-filled day of camp from 9am-4pm, he had a summer cold too. When he was asked in the morning if he wanted to go to camp, he crawled to the door to get to the car. Ben's counselor, Tanner, sent photos to me during the week. I was actually away visiting family and it was so good to see Ben having a good time. It is good to see the counselor having a god time too. On one of the last days, the camp brings in inflatable slides and climbing equipment. 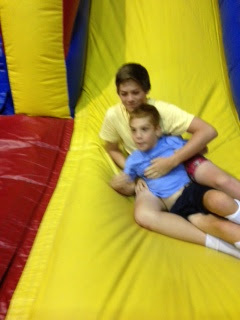 Tanner promised that Ben would get a chance to go down one of the slides. As you can see, he kept his word! Since March, we have had a revolving door of staff working with Ben. Rather than discuss the gory details of each case, I decided to pass on what I learned from the experience. Having staff in our home is both a blessing and a curse. 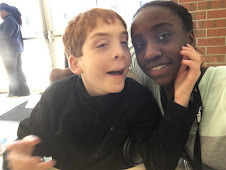 It is wonderful to have someone to help with Ben's personal care and independent skill building. It gives me a break and also helps Ben work on skills I may not have the time to do or are not skilled at teaching. However, it also means that there is a loss of privacy within our home. Feeling comfortable with the people who work with Ben is imperative to me. His safety is my first priority. It is not only what a staff person may or may not do, but it is the gut feeling I get when it does not feel right. I may not be able to put my finger on the problem, but that should not discount my feelings. These are a few things I have learned, and I would love for others to share any tips or ideas they have picked up through their own experiences. Trust your instincts and talk about any concerns with your spouse. Getting someone else's viewpoint can help you see the situation from another perspective. Try any new staff for one month, scheduling only a few hours to get a feel for the person's style. Let them know ahead of time what you are doing. This gives them an out also. They may also think this is not a good fit after a trial period. It does not have to be personal. Staff may not fit for your family's style, but might work well in another setting. When things are not going well with staff, it is normal for the parent to feel stress, anxiety about the situation, and uneasiness with how to handle the working relationship. These are signals that perhaps something needs to change. Use resources around you for support - hiring agency, case workers and other people you trust. They are trained to help and most likely they have dealt with these types of situations in the past. If it is possible to discuss the issues with the staff person, be sure to have someone from the hiring agency involved. Document issue and include date and any specific information, if possible. In some cases, speaking with the staff person will not get the desired results and you need an exit plan. How will you decrease their hours? Who will discuss this with them? When you do find a staff member who loves your child and are the answer to your prayers...be sure to tell them how much you appreciate their work. It is a two-way street and everyone has to feel good about the situation. Many months ago, I was told about a place Ryan and I could go for a weekend away. No charge, no hassles and meals included. Always the ever trusting and thrifty person, I tried to book a weekend in March, but it was already reserved. We finally scheduled a date for this past weekend, which worked out well because our 15th wedding anniversary is in just a few days. So what's the deal? Free lodging, food with no strings attached? Cannot be believed! Yup that's it. No 90 minute program on purchasing a time share, no recruitment into a religious cult and no scary dungeon with a dragon waiting to be fed two unsuspecting parents. 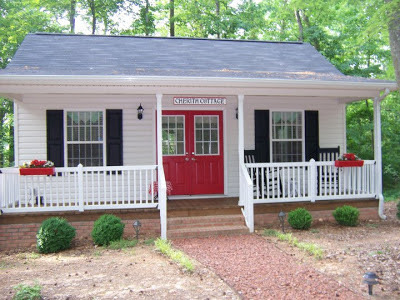 You may read about their story here: Cherith Cottage. They are also on Facebook. If you are interested in staying at the cottage, simply send them an email introducing yourself and that you heard about their ministry through eSpecially Ben. This will get the conversation rolling. If you have doubts about taking advantage of a weekend away, STOP right there. Take the time away - do it for yourself, your marriage, your relationships and your friendships. Doing something for yourself has gotten a bad rap. It is okay to care about your own well being, and to be concerned about your own needs. And if it is not Cherith House, let it be something else that feeds your soul. You will only be better for it.